Brian Blanco/Getty ImagesNew Jersey Governor Chris Christie speaks on stage prior to Republican presidential candidate Donald Trump’s town hall meeting on March 14, 2016 at the Tampa Convention Center in Tampa , Florida. New Jersey Gov. 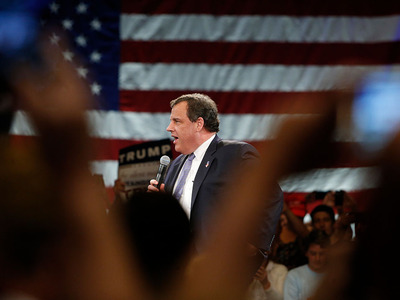 Chris Christie sharply criticised the media Tuesday, telling reporters in Mendham Township that they were giving “too much attention” to Donald Trump’s controversial remarks on US District Judge Gonzalo Curiel. “Let’s focus on what needs to be focused on here, and quite frankly, I think you all are paying much too much attention on this,” the Republican governor said. “The fact is, the media loves controversy, the media loves to pay attention to this stuff and to work it up,” he added. Christie, a fierce backer of Trump, said he understood why the media was intensely focused on Trump’s assertions that Curiel can’t fairly evaluate cases involving Trump University because of his Mexican heritage. But he scolded reporters for not moving on. “The fact of the matter is, people who are going to vote today in New Jersey and people who are going to vote in November are not going to make their decisions based on this kerfuffle,” he contended. Trump has repeatedly said Curiel, who is presiding over two lawsuits involving the real-estate mogul’s now-defunct Trump University, cannot be impartial because “he’s a Mexican.” The real estate mogul has argued Curiel’s heritage is relevant because of Trump’s promise to build a wall along the US-Mexico border if he’s elected in November. The comments from the New Jersey governor came as prominent members of the Republican Party distanced themselves from Trump’s remarks. House Speaker Paul Ryan said Tuesday Trump’s comments represented the “textbook definition” of racism, but clarified later that he was “not” saying the billionaire is a racist. A Republican congressman from New York made a similar argument during a CNN appearance.